Make sure that your sales team are rewarded for their performance with PromoServe's Commission Reports, which allow for real-time commission reviews and employee outputs. Most Commission Systems are supported; ask your consultant to make sure your specific requirements are covered. 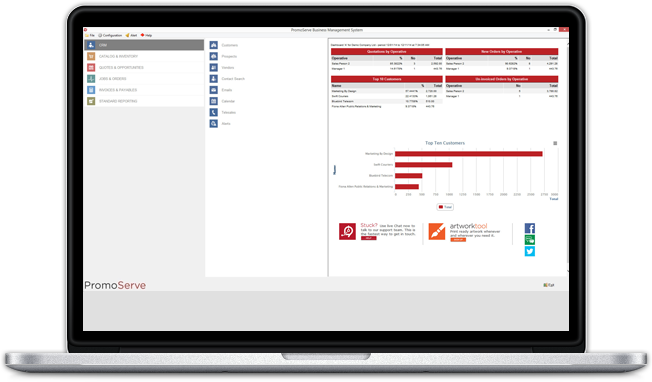 PromoServe also delivers Profit & Loss Reports by Sales Person or Department, providing a clear breakdown of P&L statements throughout the company. 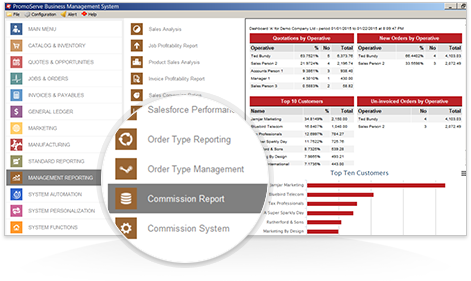 A selection of hugely important reports, including Product Sales, Invoice Profitability and Salesforce Performance are made available within the Management Reporting menu. These powerful reports will help you manage growth, identify your most successful relationships, and focus your time most profitably. 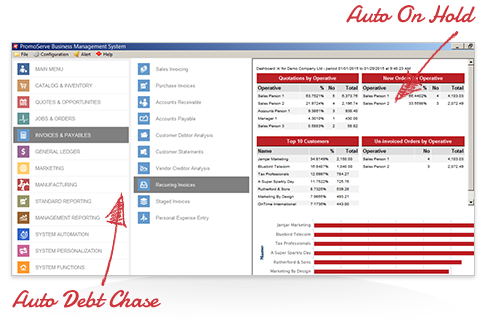 The Advanced Accounts Pack includes Auto On Hold and Auto Debt Chase routines, reducing the risk and vulnerability surrounding slow-paying customers. It has the ability to create staged and recurring invoices, allowing you to bill a customer for a company store on a monthly basis, for example. 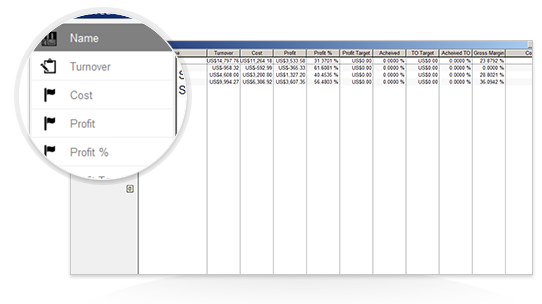 Department / Cost Centers are also included in the Advanced Accounts Pack, so you can manage marketing expenses etc.